One of Ted Jordan’s most popular systems was the Linear Array. This vertical arrangement of four Jordan 50mm units gave many of the benefits of a taller, floor-to-ceiling line source but at much lower cost. The 50mm Module Array required an additional bass system but a Jordan Eikona Array is a stand-alone system. Four Eikonas are equivalent to a single 250mm bass unit in terms of cone area but have lower mass, faster transient response and greater sensitivity. This makes an Eikona Array a compelling alternative to the industry standard of speakers with passive crossovers and large, heavy bass units. The design can be realised in a number of different ways. One of the simplest and most elegant is a reflex enclosure. 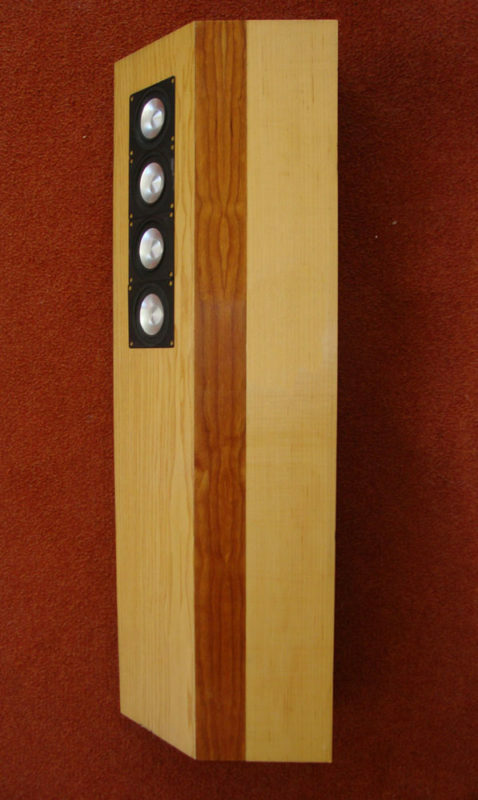 By adjusting the height of the Array for seated listening, we arrive at a floor-standing loudspeaker which is 1200mm high, 340mm wide and 125mm deep. The cabinet can be constructed from 18mm MDF or Baltic birch ply. In general we prefer ply as it is more pleasant to work with, weighs less and is more robust. We recommend fitting a low-profile grille as it protects the drive units from dust and inquisitive fingers. Arguably it also has a psychological benefit as it’s easier to concentrate on the music when you aren’t distracted by moving cones. In use, the speakers should be turned-in 60 degrees so that the listening axes cross in front of the listener. This gives the most stable stereo imaging, with a wide listening angle; central images remain central as you move left or right. The system sound integrates at distances above three metres so these are not near-field loudspeakers but work very well in larger rooms. The increased sensitivity over a single Eikona system makes the Array a good match for high quality, lower-powered tube amplifiers. A full plan is available here. A triangular, sealed-loading version of the Linear Array is featured here. Tagged Jordan Eikona, linear array.